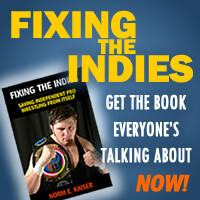 The official site of the revolutionary new pro wrestling book "Fixing the Indies"
This is the revolutionary new book that’s shaking up the world of independent pro wrestling. Prepare yourself to finally learn what it takes to succeed and make money in the indies. "This book is required reading for anyone in the pro wrestling business." Come discuss the book and find out more at Wrestling 911, the hottest pro wrestling forum on the web! © 2012 Foxbat Books. All rights reserved.